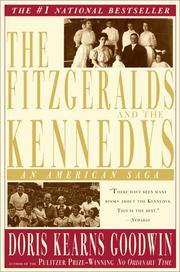 What, at this late date, could possibly be added to the oft-told story of the Kennedy clan? Quite a lot it develops. Indeed, Goodwin's lengthy but unfailingly engrossing version provides fresh insights on the family's three-generation rise from the mean streets of Boston's North End to the White House--and the struggle of 19th-century immigrants to make their way in a not altogether hospitable land of opportunity. Herself the granddaughter of Irish immigrants, the author (an LBJ biographer and sometime Harvard historian) had access to a wealth of previously unexamined source material, notably 150-odd cartons of personal papers belonging to Joe and Rose Kennedy. She also had the cooperation of the family and friends, including matriarch Rose, whose memories were refreshed by the long-lost records, which ranged from her own diaries through business documents and report cards for the nine Kennedy kids. Happily, Goodwin's familiarity breeds neither contempt nor blarney. She offers and interprets the facts of a peculiarly American saga in commendably evenhanded fashion. Her three-part narrative opens with the 1863 baptism of John Francis (Honey Fitz) Fitzgerald, who gained local fame and fortune as a Bay State poi; it closes with the inauguration of his grandson, John Fitzgerald Kennedy, as the 35th President of the US. At stage center, though, are Rose, Honey Fitz's first and favorite daughter (a deeply religious but, by Goodwin's account, worldly-wise woman), and her husband, Joseph Patrick Kennedy. The founding father, who amassed a considerable fortune as an archetypal outsider, earned a reputation for ruthlessness and philandering. But to his children, the author shows, this tough-minded man was an unstintingly devoted and proud parent. The final section of the text focuses on the golden girl and two sons who were reaching adulthood as their father transcended the establishment that never wholly accepted him by becoming FDR's ill-starred ambassador to the Court of St. James. Joe Jr., bearer of the family's aspirations, was killed in action toward the end of WW II, and the beloved Kathleen, who against parental wishes married out of her Catholic faith, died in a plane crash a few years after the war. The torch was thus passed to JFK, who accepted it, albeit with some misgivings, and tacitly assented to a new bond with his demanding father. An obvious must for Kennedy buffs. But also an evocatively detailed account of great achievement and dashed hopes, which supports Hardy's bleak conclusion that character is fate. There are scores of illustrations, many of which look to be candids from family photo albums.